Collages now, but this will develop in time into photo albums. In 2016 and 2015 we were in the Royal Arcade, which is generally lovely, but especially so at Christmas. For the 2019 Christmas season, we envisage being in a shop by mid-October. If you have any questions, and especially if you know of a central Norwich shop available for free, please fill in the Contact Form. Is a non-profit charity that has been supporting children & adults with sight loss for over 200 years. The NNAB enables its members to enjoy active, independent & fulfilled lives by providing safe, suitable accommodation & care with a supported social, leisure & educational activities program. With over 32,000 people losing their sight in Norfolk & this local charity is positioned in the Counties hospitals ready to guide the visually impaired to the correct services & to advise them on what equipment they might need to live a total independent life. Break is a Norfolk based charity, providing support across East Anglia for 50 years. We aim to make life better for vulnerable children, young people and families, because we believe that every child and young person needs a home where they feel safe and loved, so they can grow in confidence and look to the future with hope. That is why we work tirelessly to help young people in care and moving on, children and young people with disabilities, children at risk, and families in need of support, finding a way through difficult times and opening the door to brighter tomorrows. This residential home in Sprowston Road, Norwich provides accommodation in their own flats for around 25 mainly young disabled people. 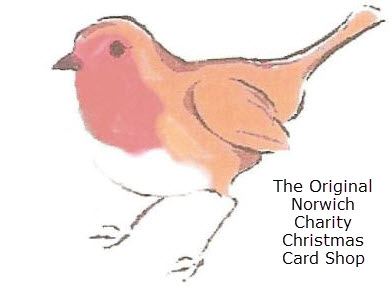 Funds raised from card shop sales goes to the local Friends Group who provide financial and practical support to the home. It is run by Livability, a national charity with a Christian ethos, President the Archbishop of Canterbury, formed in 2007 by joining two 19th century charities, John Grooms and Shaftesbury. It is committed to enabling people to live the lives they want to live by providing a wide range of community-based services. Samaritans’ vision is that fewer people die by suicide. Norwich Samaritans is a local charity offering a free, confidential, 24-hour listening service to persons in Norwich and the wider UK, for anyone who is going through a difficult time. We offer this via phone, email, SMS and face-to-face visits. Whatever you’re facing, we are here to listen. We also support two local prisons by training prisoners to offer emotional support to peers. Out in the community, we deliver talks in Norwich schools, universities and community groups to encourage a better understanding of suicide, and the value of expressing feelings. To allow us to work with more participants we have built The Nest, this will be our new multi-purpose community hub in Horsford. When completed, it will feature an indoor sports hall, a gymnasium, a floodlit 3G football pitch, and classroom facilities, in addition to the renovation of the clubhouse, installation of residential ‘bunk boxes’, and the relaying of seven grass football pitches, which was completed in 2018. In order to make this exciting vision a reality, we have launched a public fundraising campaign – #BuildTheNest – to raise the £2.5m we need towards the total project cost of £9.4m. St Edmunds Society (CIO) was formed 54 years ago, initially a Homeless Organisation which changed direction in 2012 and now operates a Vocational Training Centre for young people aged 14/24 offering Construction, Transport Maintenance, Catering & Hospitality Hair & Beauty, courses, functional skills, Maths, English and GSCE’s. We are proud to offer a range of trade related qualifications for school and post sixteen students with a unique Pastoral and Welfare support provision on offer, headed up by a qualified Social Worker. Last year, we granted life-changing wishes to more than 1,00 children and young people here in the UK. For a desperately ill child, a wish is life-changing and transformational. When a child turns to us, we take them on a carefully structured Wish Journey. The whole Wish Journey – from wish capture, to building anticipation to lasting memories, aids physical and emotional healing. Building resilience and helping children to better cope with their critical illness. From capturing their One True Wish to building anticipation and creating lasting memories – a wish changes lives and we can’t do that without your support. Hearing Dogs for Deaf People is a national Charity that trains Dogs to help Deaf people leave loneliness behind and reconnect with life through constant companionship as well as alerting to important and life saving sounds like the smoke alarm, alarm clock and oven timer. Their burgundy coats also signal to the public that their partners are deaf. The combination of practical assistance and life long friendship can be completely life changing. The Charity supports each hearing dog partnership for the life time of the partnership and receives no government funding, relying entirely on the support of the individuals and organisations to continue its work. support from the local community including donations, grants and fundraising. works in 120 countries including the UK. Save the Children fights for children every single day. We do whatever it takes to make sure they survive, get protection when they’re in danger, and have the chance to learn. Save the Children believes every child should be able to make their mark on their world, and help to build a better future for us all. exists to save lives by delivering highly skilled doctors and critical care paramedics by air or car to seriously ill or injured people in the region. Covering the counties of Bedfordshire, Cambridgeshire, Norfolk and Suffolk we are tasked an average of eight times a day. We fly two H145 helicopters that allow us to get anywhere within our region in 25 minutes. We receive no regular government funding. Needing to raise over £12million a year, we are a life-saving charity that is only kept airborne thanks to our incredible supporters. Rough sleepers need a roof over their heads. They need a warm bed. And St Martins provides that. But they also need a reason to get out of it in the morning. St Martins helps homeless people, and those at risk, by offering them a hand up. We nurture their self esteem and trust in other people. We empower them to make positive choices. To some, we are a lifelong solution. To others, we are a stepping stone to rebuilding their lives. St Martins is a local charity and we have supported homeless people in Norwich and Norfolk for over 40 years. Amnesty International is a global organisation, campaigning for Human Rights for all. Founded in London in 1961 it now has 7 million members who campaign and write letters to publicise abuses by authorities of those Rights enshrined in the Universal Declaration of Human Rights. "What are Human Rights? Human Rights are like air: untill they're taken away you don't know what you have. You only realise how necessary they are once the air is taken away from you:" The Norwich Amnesty Group meets monthly: we campaign by writing letters, often to international government officials, urging them to address their illegal actions. aims to support the conservation, maintenance, repair and improvement of the fabric of the building and furnishings of Norwich Cathedral. Assist Trust is a Norwich based charity supporting adults with Learning Disabilities. The day service is centred around progression, confidence building and developing resilience as well as providing a social setting where an individual can forge friendships and sustain relationships. Their services include Employment and Travel Training, Housing Support, Daily Living Skills, Health & Wellbeing promotion through Sports and Healthy Living groups, Gardening and outdoor activities and many more groups all focused on developing strengths. Was formed about 7 years ago by a group of professionals involved in Palliative Care at the Priscilla Bacon Lodge in Norwich. The only Hospice in Ethiopia ( population 100,000,000 !) we fundraise to educate, support and extend the scope of care available, currently only in the Addis Ababa area. From a Hospice struggling to survive, we have become their main donors. We now have doctors, nurses and other professionals trained and interested in palliative care. As our name becomes more widely known, we attract more interest: i.e. The Norwich Diocese Lent appeal in 2017 raised £46,000.00 to buy and help maintain a four wheel drive vehicle to enable Hospice at Home care to expand. 100% of all donations goes directly to the charity. Keeping Abreast offers support to women who have been affected by, or are at risk of, breast cancer and who are facing breast reconstruction as a result of having a mastectomy. At an exceptionally difficult time, we offer women and their families support through our network of volunteers and local groups, giving them the opportunity to talk to other women in similar positions. We provide information, advice, a ‘show and tell’ experience, and other financial and practical help.